The Culver City Historical Society, like most non-profits, was established for all the right reasons! The effort was led by former Fire Chief and Mrs. John Kearney, Parks and Recreation Director Syd Kronenthal, and many others like Clarita Marquez Young, (our Madrina), Frank McCann, Cathy Zermeno, (first president), Charles Lugo, Rusty Kostick, Esther Tarn, and a host of others who have taken leadership roles over the years. Their motivation and selfless gifts of time and energy continues to preserve the incredible story of people who brought Culver City, the Heart of Screenland to life and renewal. Volunteering generally brings good feelings from our work. One of my early experiences in the Historical Society, which encouraged me, started with a call from a gentleman who found an oversized “book of clippings” about a man named Harry H. Culver! The church, where it had been found, wanted to return it to its rightful owner. My husband was happy to take it on as a “family adventure” so we picked it up miles away. It was, as we hoped, the big book of clippings on our city founder. Harry Culver’s daughter, Patricia Culver Battle, spoke of it as one of her family’s treasures, the book that had a special place in their Wallace Neff-designed mansion in Cheviot Hills. Sadly, it had been stolen and was never recovered. That day trip out to the Inland Empire yielded gold! It was just as Pat described it, a huge book which recorded the Culver family’s incredible year, flying across the country so Harry H. Culver could personally, as president of a national real estate association, deliver his message of the importance of responsible real estate development. The Society board decided to keep this secret, until Patricia Culver Battle could attend a meeting or event. Our expectation was that she would take it home to keep it safe for posterity. The evening arrived and yes, it was a teary surprise, and when we “unveiled it,” Pat was absolutely delighted! We were prepared to place the amazing record of Mr. Culver’s productive year as president of that professional group, in Pat’s car after the meeting. The grown up “little girl who so admired her father” turned the table on us. She wanted it to be a part of the collection of the Culver City Historical Society. And so it is. You can see the huge copies of pages in the Society’s Archives and Resource Center thanks to our city founder’s kind and giving daughter. We will make sure you get a glimpse during the Centennial! Friends, thank you for all you do! While we “suffered” through a cold winter, I received a most interesting email (which, after the holidays, was usually a 50% off code from the Gap). Former mayor Paul Jacobs recently met someone whom he wanted us to meet, a collector of letters. This gentleman had a letter that he thought would be of interest to us. Intrigued, Vice President of the ARC/Museum, Art Litman, and Historic Sites chair, Julie Lugo Cerra, and I agreed to meet them both at the ARC on a Sunday afternoon. Once we were all seated around our worktable, Art set the video on his phone to record and we were off, asking a myriad of questions – from his collecting practices to how he is connected to Culver City. Among the themes in his collection Dennis Shapiro has amassed letters from all the U.S. Presidents, #1 through #44. An interesting comment on collecting, he stated that he evaluates a letter for content, not solely on signature quality, as one might expect. He spoke very passionately about his 30-year hobby, but we know it’s much more than just an interest. It never is. A very special man, indeed. At the very end of the conversation, we thanked him for coming in to show us this remarkable letter. He then very proudly said that on behalf of his family, he would like to give the letter to the Historical Society. (I think I might have hugged him a little too hard.) For those of you keeping track, this is the first letter signed by Harry Culver to enter into the Society’s collection. A very special letter, indeed. 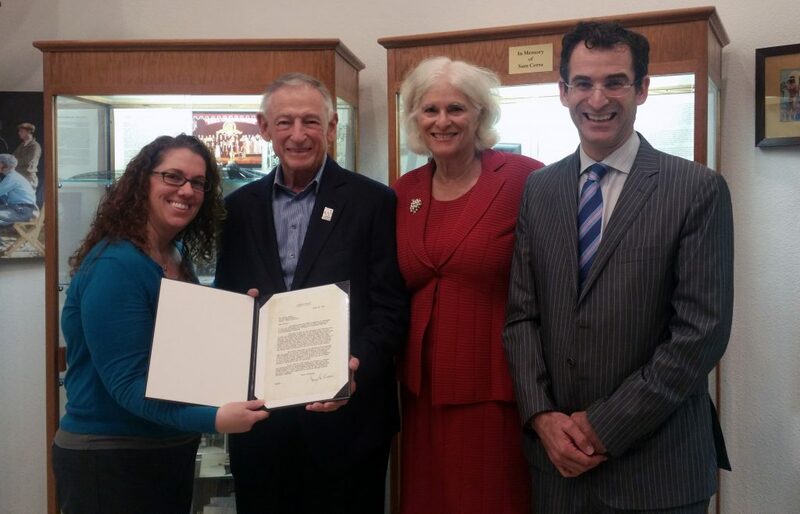 Dennis Shapiro generously gifted the letter to the Society in the name of his son, Rabbi Zachary Shapiro, his wife, Susan, and himself. 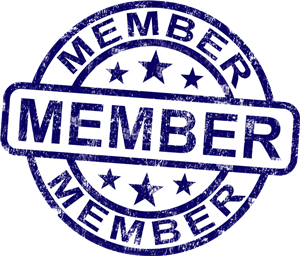 All three were our guests at the April 19 General Meeting and Program, where they officially presented their gift to the membership and could be publically thanked. 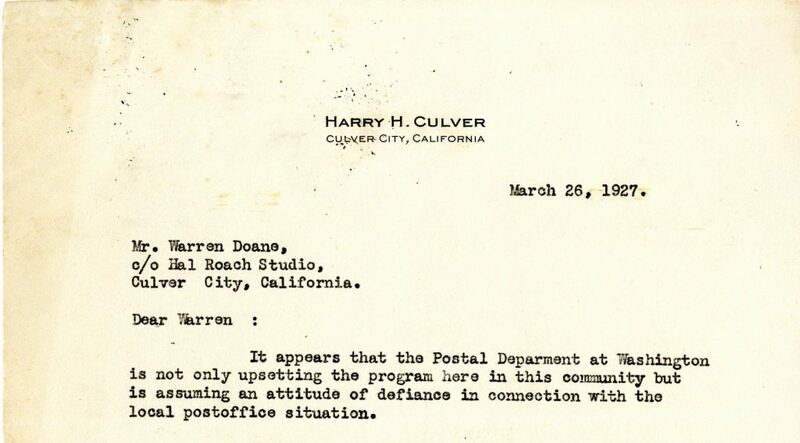 I was able to cajole Rabbi Shapiro into reading a couple of amusing passages out loud, as a one Mr. Culver encouraged Mr. Warren Doane from the Hal Roach Studio to forward a petition for better mail delivery. History does repeat itself. A very special evening, indeed. We are very lucky to have a member of the Shapiro family in Culver City on a permanent basis, as Zach is the rabbi at Temple Akiba. His parents seasonally spend time on this coast. We encourage you to come into the Archives to see this amazing letter in person. An excerpt is shown here only to whet your appetite to visit and take in the wit of Mr. Culver. There is no doubt that Culver City has an interesting history! We receive inquiries continuously asking about people, places and things. Did you know that one of the most appreciated areas of our collection is often made of fabric? Yes, first, you probably think of the MGM costume collection for which we are caretaker—but the subject is limitless. Sharon Shore, who just completed her term as our Costumes Chair, and continues to serve on the committee, offers a broader perspective on the reality that many of our fondest possessions as well as memories involve fabric. This could take the form of a quilt made by someone special, a piece of clothing created for an occasion, a unique pillow made from a grandpa’s ties, an apron constructed to be beautiful and utilitarian, and so much more! We look for fabrics and patterns to suit our taste, for our draperies, bedspreads, furniture, carpets and beyond. We make time to visit museums like LACMA, the Getty, the Huntington, or Hearst Castle whose collections make us delight in artfully constructed tapestries, costumes, and historic clothing. Sharon Shore, Director and Conservator of Caring for Textiles, a laboratory for textile conservation, maintains her private practice in Culver City. She is an amazing resource to our Culver City Historical Society. We benefit from her skills and mentorship. 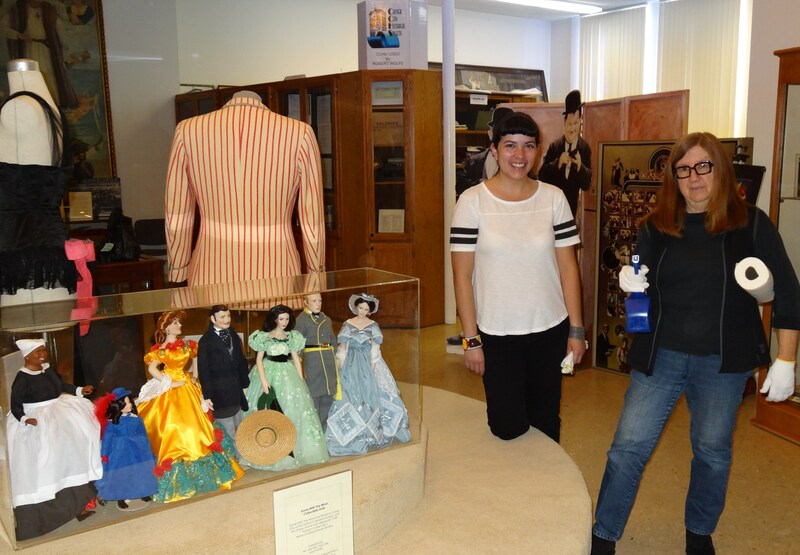 Sharon recently completed the book of research information on our costume collection. In addition, because of public interest, she and other members of her team constructed a book of the 60+ MGM Costumes. It contains photos with descriptions of each costume for public view. It is readily available for research and general interest in the Archives. Watch for an opportunity in the near future to talk to Sharon in one of our “Conversations” series on special interests, like Costumes and Fabric Conservation! Many of Culver City’s historic sites are featured on our fabric “throw” available through our onsite and online shops.